Loads of early Black Friday deals have already been leaked online, yet the major shopping holiday is still over a week away. While some of the deals are good, others are outright amazing — like 33 percent off of a robot vacuum that will clean the whole house with zero human effort needed. But some deals are actually just too good to be true, as superstore Kroger warned its Facebook fans on Monday. A coupon offering an impressive $200 off at Kroger on Black Friday has been circulating on the social media site recently. This week, the grocer confirmed that, unfortunately, the coupon is a total fake. The fake coupon appears to have been posted on a Facebook page called "Kroger Club," which is no longer active on Facebook. The text on the scam coupon read, "Kroger is Providing each family with $200 OFF Coupon to celebrate Black Friday! Simple Like & Share This Post!! And Comment Done! We Will Inbox Your Coupon Right Away!! We Will Inbox Your Coupon Right Away." The fake offer also included a promo code and an expiration date of Nov. 30. 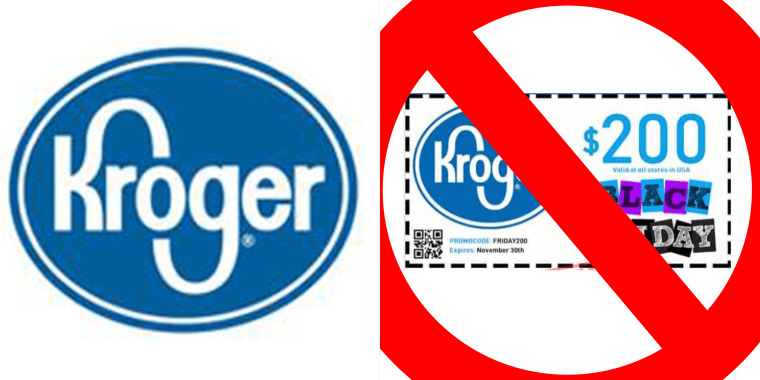 "We do not recommend engaging with the site(s) or page(s) that are sharing the coupon or providing them with any personal information," Kroger said in its warning post. "Our team is actively working with Facebook to address the concern." A representative from the company could not be reached by the time of publication. By Tuesday, Kroger's Facebook post had over 1,500 shares and over 100 comments, many from people who couldn't believe anyone had fallen for the scam. "Which store do you know that would give just give money like that! Not any store! Nothing is free," one person wrote. Another commented, "Anyone who believes these coupons, whether it's Kroger or for any other retailer, which seem to start floating around near the holidays, well..... you just do not have common sense." "I saw it and couldn't believe the amount of people that actually think it's real!! Folks will believe anything they see on Facebook. Absolutely incredible," another person commented. Even though this particular coupon turned out too good to be true, Kroger is offering some pre-holiday deals on its official promotion page. There isn't mention of a Black Friday deal yet, but it looks like plenty of customers are hoping for a good surprise after the disappointment of the fake coupon.